Ronkonkoma, New York: June 14, 2013 — Zoom North America has announced the release of the all-new H6 Handy Recorder. The H6 is the most advanced portable recorder ever introduced. It offers six tracks of simultaneous recording and employs an innovative system of interchangeable input capsules that can be swapped out as easily as the lenses of a camera. Four capsules are available: stereo X/Y and MS (Mid-Side), both included with the H6, and Shotgun and dual XLR/TRS combo capsules, available as options. The H6 can be attached to a camera strap or mounted directly to a DSLR or camcorder, and its large full-color display makes it easy to view recording and playback levels even in low-light environments. It records directly to SD, SDHC and SDXC cards up to 128 gigabytes in a variety of MP3 and BWF-compliant WAV file formats, including 24-bit / 96k for the ultimate in high-definition audio. Four XLR/TRS combo jacks enable the connection of external microphones or line-level devices. Each input has its own dedicated gain control and pad switch, as well as phantom power in three different voltages. "The H6 will provide users with a totally new level of performance and possibilities," said Scott Hagen, Vice President of Sales and Strategic Planning for Zoom North America. "We believe it's poised to become a legacy recorder that will stand the test of time." The Zoom H6 will be available in stores July 2013. 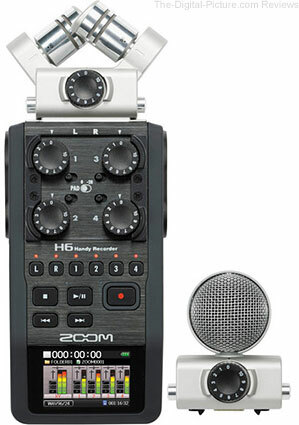 B&H has the Zoom H6 Handy Recorder available for preorder.